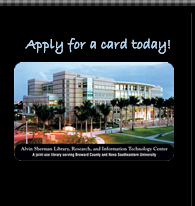 What makes NSU's Alvin Sherman Library unique? Every day of the week, our staff serves the NSU community including its students and faculty as well as the Broward County patrons. 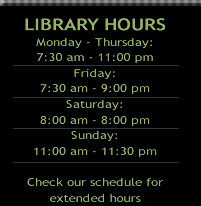 No other library in the County offers exclusive access to the University's academic library. We are committed to serving the public and continue to develop programming that is entertaining and captivating. This month's programming won't disappoint, especially lovers of history. 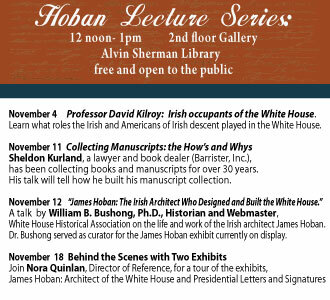 Check out the Hoban Lecture Series created in conjunction with our two featured exhibits. Special guest lecturer is Dr. William Bushong from the White House Historical Society. 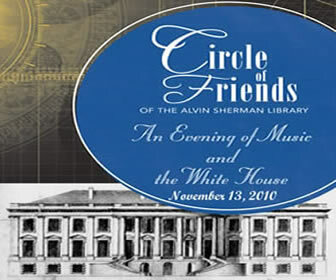 For those who want to to join the Library's Circle of Friends, we invite you to enjoy a special Evening of Music and the White House, featuring nationally renowned violinst, Joan Kwoun. Click here to learn more about this special evening. All proceeds benefit the Alvin Sherman Library. 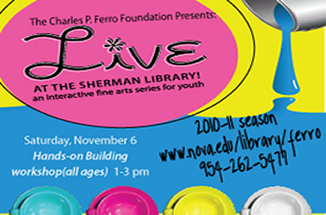 November 6th kicks off year three of the Charles P. Ferro Foundation "Live at the Sherman" with an innovative Hands-on Building workshop program. Check out our link to reserve your spot. The library will be closed November 25th, 2010 for Thanksgiving and the day after. The library will also close early at 6pm on Saturday, November 13. 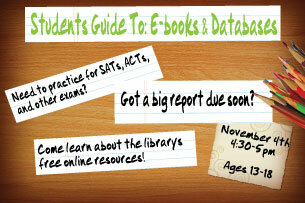 Students interested in learning more about these databases, should attend the presentation on November 4th, "Students Guide to E-books and Databases" at 4:30pm. Provides access to five cultural resources: The African American Experience, The Latino American Experience, The American Indian Experience, Daily Life Through History, and Pop Culture Universe. Includes e-books, interviews, maps, images, audio, music files, and timelines. Provides detailed information on colleges and scholarships as well as practice tests and e-books. Learn how to develop the skills your child needs to be ready to read. Explore the world online with kid-friendly sites recommended by librarians! What do you want to be when you grow up? Explore the world of all sorts of fun jobs: find facts about farmers; learn about librarians; read about rock stars; and sing about sailors! November 10: Hooray for Veteran's Day! Celebrate the men and women in uniform and draw a picture for the troops! Featured books include We the Kids by David Catrow, This Land is Your Land by Woody Guthrie, and Drummer Hoff by Ed and Barbara Emberley. Read, sing and dance about pizza! Act out the classic pizza story, Pete’s a Pizza by William Steig, and pick a pizza poem with Jack Prelutsky’s A Pizza the Size of the Sun. November 4: Concept Books, Colors to See for You and Me! Explore the beautiful world of colors with silly, simple stories and songs selected just for children ages 6 – 36 months! Concept Books introduce and reinforce ideas on ABCs, numbers, shapes, and colors and connect children’s real life experiences to abstract ideas like opposites. Borrow a book from our Concept Book collection and explore topics which interest children in an enjoyable way. November 11: Concept Books, 1,2,3, for You and Me! Explore the world of numbers with silly, simple stories and songs selected just for children ages 6 – 36 months! November 18: Concept Book: A,B,C for You and Me! Explore the alphabet with silly, simple stories and songs selected just for children ages 6 – 36 months! Hang out in the Teen Room! Play PS3 & Xbox360 video games, watch movies, or even do homework! The Teen Room is open after school and on weekends just for teens ages 13-18 whenever a Teen Room Host is available. Check the Teen Room Blog for volunteer info, teen events, and lists of new library materials for ages 13-18 at http://blogs.library.nova.edu/teenroom. Find us on Facebook! Get up-to-date info on teen events for ages 13-18 by becoming a fan of “Teen Events at the NSU Alvin Sherman Library” on Facebook. Come discuss Harry Potter and the Deathly Hallows by J.K. Rowling in celebration of the film version’s release this month! Enjoy licorice wands and butterbeer as we chat about our favorite Hogwarts characters! Think you have what it takes to be a writer? Take the challenge- write an entire novel in just 30 days! 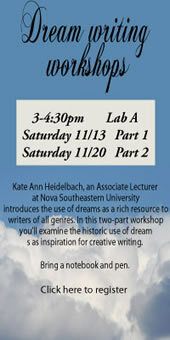 Come find out how as we celebrate National Novel Writing Month. Come discuss your favorite shōnen and shōjo! If you are not already a fellow Otaku (fan of manga), then come find out what makes them so awesome! For current TAB Members, Teen Room Hosts, and Teen Volunteers that want to join TAB. Come discuss plans for our upcoming teen events or train to become a Teen Room Host! This month’s pick is Book of a Thousand Days by Shannon Hale. What would you do if you were to be forced into an arranged marriage: go along with tradition or rebel for your independence? Come discuss this new twist on a classic fairy tale! Hang out in the Teen Room and play your favorite PS3, Xbox 360, and Wii games, including DJ Hero, Guitar Hero, and DDR. Earn community service hours for school! Visit the PLS Desk on the first floor of the library or http://blogs.library.nova.edu/teenroom/volunteer/ for applications and instructions. Limited spaces are available. Applications must be submitted prior to orientation. Applicants will be contacted via email on a first come, first serve basis to attend. Website Basics If you’re a Boomer who is retired or will soon retire and you are thinking about starting your own business or are a small business owner already wanting to accelerate growth or add a social impact component to your business, you won’t want to miss the Boomer Entrepreneur Initiative. These workshops are presented by the Florida Women's Business Center (FWBC) and funded by the Community Foundation of Broward. The FWBC is a program of the TED Center. Registration is required. Culture Vultures: A German Life – Against the Odds Change is Possible. Join author and North Miami physician Dr. Bernd Wollschlaeger as he recounts his life as the son of a World War II German tank commander. His book catalogues his personal journey and demonstrates how history impacted and devastated his family. If you’re a Boomer who is retired or will soon retire and you are thinking about starting your own business or are a small business owner already wanting to accelerate growth or add a social impact component to your business, you won’t want to miss the Boomer Entrepreneur Initiative. These workshops are presented by the Florida Women's Business Center (FWBC) and funded by the Community Foundation of Broward. The FWBC is a program of the TED Center. Registration is required. This brief introduction will highlight some of the better-known spiritual practices of Native Americans that interested persons are likely to encounter locally. It will be especially beneficial to those who have an interest in their life ways, but are not sure how to conduct themselves at certain events, such as, ceremony. Topics will include Pipe, Sweat Lodge, and Medicine Wheel. Rick McBride, whose Spirit-name is Cante Lute, is a mixed-blood Tsalagi (Cherokee), sundancer, and ceremony leader. Please visit his website at: http://mxdblood.com for more information. Sign up here! A research group for those interested in African-American Genealogy. Learn how to connect to the Internet and search your favorite topics. Prerequisite: Competence in using computer keyboard and mouse. Sign up here! Learn how to create a slideshow presentation using Microsoft Powerpoint. Whether it’s a project for work, school or just for fun Microsoft Powerpoint can provide the extra finishing touch you need. Prerequisite: Basic computer skills. Sign up here!